Wholesome & hearty. 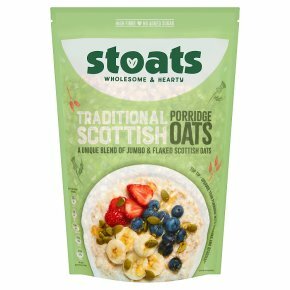 A unique blend of jumbo & flaked Scottish oats. Naturally high in fibre. 100% wholegrain oats. Natural source of protein. No added sugars. Suitable for vegetarians. There's nothing quite like traditional porridge. We take wholegrain jumbo oats for bite and combine with the classic smooth, creamy finish of flaked oats. An excellent source of fibre and slow release energy, our traditional porridge is perfect to be enjoyed on its own, or as a canvas to let your culinary creativity shine! We do our best to remove oat husks but the odd one may slip through. Mix 1/2 a mug of Stoats porridge oats with 1/2 a mug of water and 1/2 a mug of milk in a pan.Slowly bring to the boil.Keep stirring on a medium heat for 3-4 minutes.When the porridge thickens to your desired consistency, tuck in and enjoy! (850W):Mix 1/2 a mug of Stoats porridge oats with 1/2 a mug of water and 1/2 a mug of milk in a large microwavable bowl.Cook on full power for 2 1/2 minutes*, stopping to stir the porridge after each minute.Leave to stand for a couple minutes. Tuck in and enjoy! *Cooking times may vary.